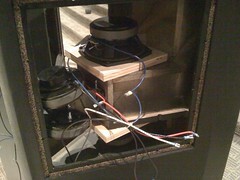 The photo here is just one of the many components we recently retired from the main loudspeakers in the east auditorium. 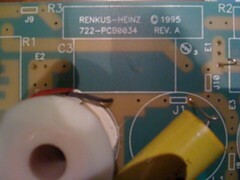 You can note the vintage of this particular component stamped on the board. 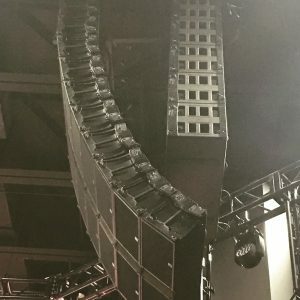 It has been a recurring theme for folks familiar with the system to talk about how worn out it has been for the last two years, and about a month ago the speakers reached a point where they could no longer work without audible distortion. The truth is I had been holding out on pushing for repairs since the grand plan was to upgrade our campus to the same level as our other campuses, but unfortunately the deterioration of the equipment beat us to it. So we opted to do the best we can with what we’ve got, and that meant finally giving our loudspeakers some much needed work. 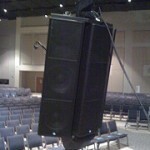 So in a nutshell, we did a complete overhaul on our main loudspeakers a couple weeks ago. 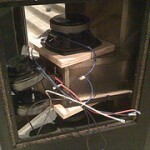 When I say complete, I mean we kept the cabinets and the grilles and the insulation and the little wires inside. OK, maybe by some standards it wasn’t complete, but for all intents and purposes, those boxes might as well be new at this point. And it was absolutely not fun getting them there. Over the last two years we’ve done a lot of driver replacing and loudspeaker surgery, but these boxes were by far the most difficult we’ve ever worked on. We started the project first thing Monday morning by bringing in riggers to lower the boxes. We’ve worked on a lot of boxes in the air over the years, but for a project of this magnitude it is always easier and safer to just bring everything down to fix it on the ground. We had three clusters of three loudspeakers, and the design of the boxes also required the clusters to be blown apart to access the horns from the sides. 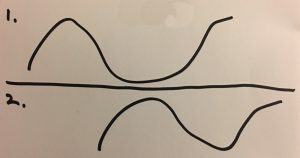 Given where the project ended up going, trying to do this in the air would have been nearly impossible. Once the clusters were on the ground and apart, we started opening up the horn access panels, and that’s when things got crazy. It wasn’t long before we realized there was no way to do all the work we had to do without removing every component we could. If it had a screw in it, it had to come out regardless if it was getting replaced or not. We had to continually turn boxes upside down and on their side to get at things. Getting tools into the small spaces not really designed for tools also created a lot of frustration as the time seemed to fly past us. 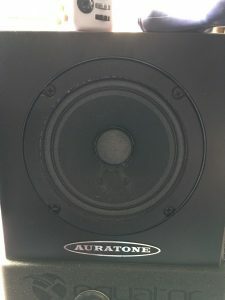 When it came time for me to start work on the crossovers, there was more frustration and confusion as the new crossovers for the loudspeakers had been customized for us at the factory since these speakers have been discontinued for quite a while now. The new components were a different size than the old ones so we had to re-drill the boxes to make them fit. In addition, the labels on the PC board didn’t match with the schematics we had been given so there were a lot of photos and phone calls being sent back and forth. By five o’clock we hadn’t even finished one box, and did I mention that we needed everything done by Tuesday morning? 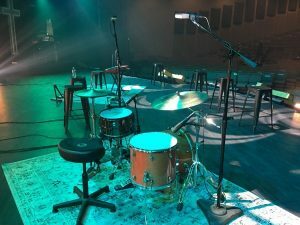 In comparison, we did a similar project on our west auditorium PA last summer and had everything changed out in half a day once the boxes were on the ground. Thankfully our volunteers rock, and some of them were gracious enough to come in at the last minute and lend a hand to fixing everything. I don’t exactly know what happened, but at some point things started clicking and we were able to get all the new components in and tested just before facilities could kick us out to lock up the building at eleven. Monday was a very long day, and I knew it was going to be a hard day going into the project. However, my hope was that we could take it a little easier for the rest of the week while I focused on tuning the system, and the rest of our team focused on getting ready for Sunday. As it turned out, Monday was definitely the hardest day of the week, but I can’t say that things really got easier for the rest of it….